The GFX-460 B temperature regulator is a water resistant device which operates within a range from -50ºC to +300 ºC. The GFX- 460 B temperature regulator can control heating systems in laboratory devices such as magnetic stirrers, etc. A temperature ringing is minimized by means of a Fuzzy control. This type of regulation disables the heating system before the reference value is reached. The GFX-460 B temperature regulator can be connected to various Pt100 sensors (optional) such as a fiberglass mat sensor (Ø 7 mm) used for particularly aggressive substances. The GFX-460 B Temperature regulator constantly shows the temperature according to the selected unit "ºC" or "ºF". The GFX-460 B Temperature regulator updates measured values every second. If the temperature increases or decreases, the temperature tendency will be shown on the left side of the display. 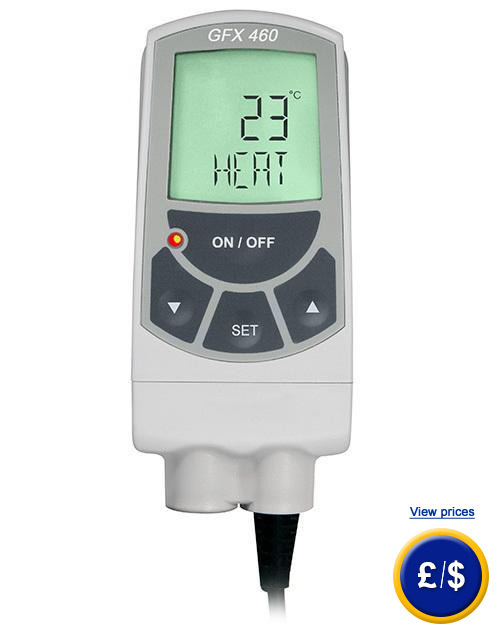 If the GFX-460 B Temperature regulator gives the order to heat, the device will activate the switch which regulates the controller of a laboratory device. The color of the light emitting diode changes from green to red at the lower side of the display. The symbol »HEAT« is simultaneously displayed below the measurement value. Just before reaching the reference value, the GFX-460 B temperature regulator deactivates the switch. The light emitting diode changes from red to green. The »HEAT« symbol disappears. 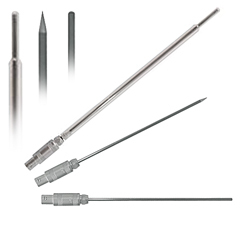 Here you can find other temperature regulators available at PCE Instruments. - Regulation of magnetic stirrers, etc. You can order different sensors for the GFX-460 B temperature regulator. (Please order them separately, otherwise the device will be delivered without any sensors).